This entry was posted in Architecture, Built on spec, Charles A Alexander, Danforth Street, Double House, Greek Revival, History, Then & Now, William Widgery Thomas and tagged 19th Century, Architecture, Charles A Alexander, Greek Revival, History, images, Maine, Portland, Portland Maine, Then and Now, William Widgery Thomas on February 27, 2019 by alewifecove. 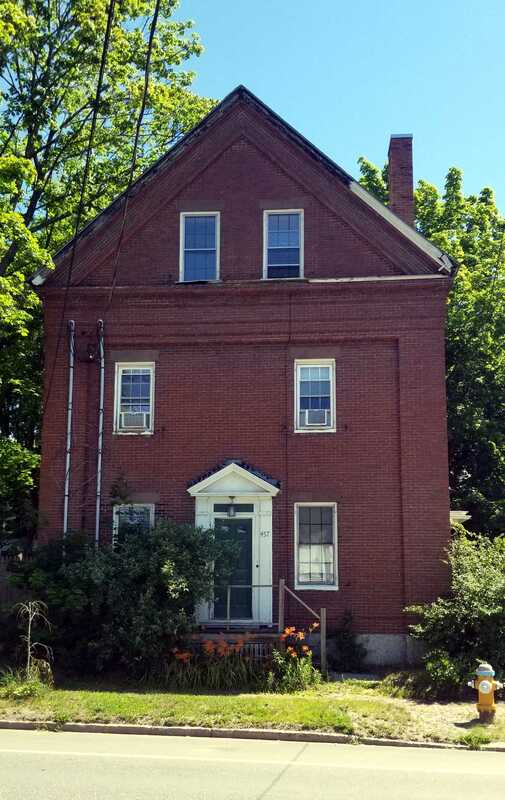 A brick Greek Revival between Granite and Falmouth Streets. Built for J B Brown and St John Smith. Yes, the street was named for him. This entry was posted in Brick, Glimpses, Greek Revival, History, Images, Off the peninsula, Survivor, Then & Now and tagged 19th Century, Architecture, Brick, Greek Revival, History, images, Maine, Portland, Portland Maine, Then and Now on February 1, 2019 by alewifecove. A large brick Italianate on the corner of Pine and Lewis Streets. This entry was posted in Architecture, Brick, Condominium, Greater Portland Landmarks, History, Images, Italianate, John Calvin Stevens, Pine Street, Then & Now, West End Walks and tagged 19th Century, Architecture, Brick, Greater Portland Landmarks, History, images, John Calvin Stevens, Portland, Portland Maine, Then and Now on January 20, 2019 by alewifecove. Built ca: 1850-51 for Charles H Green by Charles Frost and Edward P & Sewall C Chase. This entry was posted in Apartment, Brick, By Request, Charles Frost, Edward Chase, Greek Revival, History, Images, Roman Catholic Diocese of Maine, Sewall Chase, Then & Now and tagged 19th Century, Architecture, Brick, Greek Revival, History, images, Maine, Portland, Portland Maine, West End on January 10, 2019 by alewifecove. A well designed and built Italianate just off State Street in the Deering Street historic district. This entry was posted in Architecture, Deering Street, Francis Fassett, Glimpses, History, Images, Italianate, Parkside, Then & Now and tagged 19th Century, Architecture, History, images, Italianate, Maine, Portland, Portland Maine, The Great Fire of 1866, Then and Now on December 12, 2018 by alewifecove.